The beauty of art is not always only in the aesthetic appreciation, it can be just as much about the idea behind the piece. What’s more, the idea behind the creation does not have to be a complex or philosophical one. An artist can change a person’s perspective of a medium, a material or a concept by utilising their resources in a clever way. Here are some examples of artists who have taken a basic idea and created something truly amazing. These illustrations may not look simple but the idea behind them will surprise you. Artist Chris R Wright composed these pieces using only a biro. His ‘Brawling with my Biro‘ collection includes caricatures of famous musicians, horror characters and more straight forward portraits. The self-taught artist appears to have taken doodling to it’s logical conclusion. The simple compositions of Javier Perez, AKA Cintascotch have earned the artist over 130,000 followers on Instagram. The Ecuadorian also has a simple maxim: ‘Create every day. No matter your skills’. 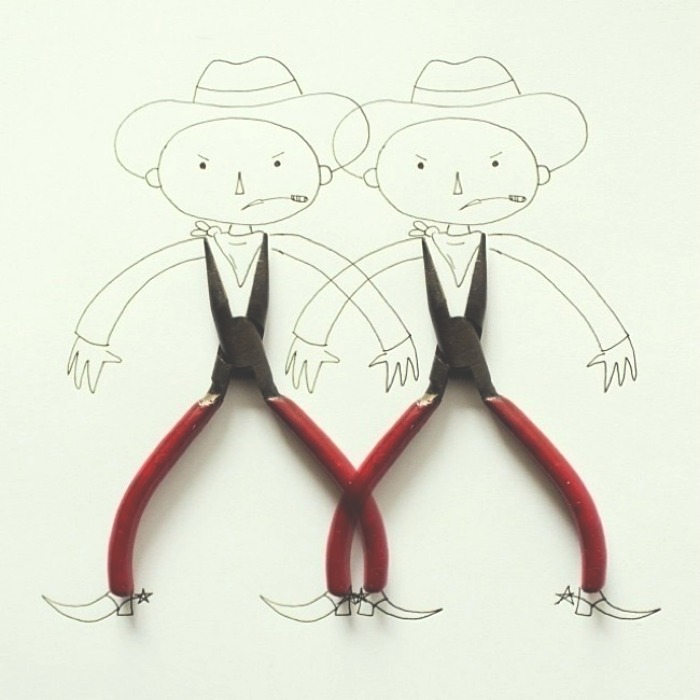 The pliers cowboys constructed above are typical of Cintascotch’s whimsical creations. 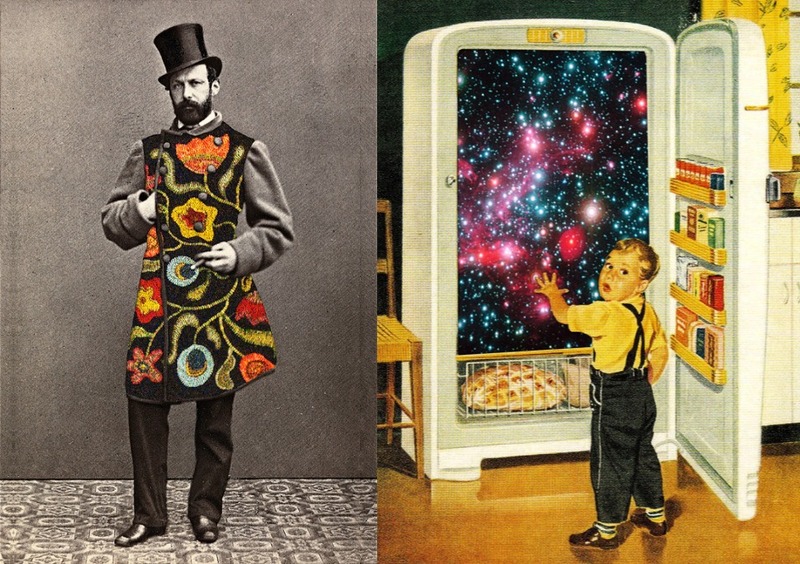 Vintage collage artist Eugenia Loli likes her images to tell a story and also, often contain a bit of wit. The above left image is part of a collection simply called ‘Fabulous Gentlemen’ whereas the right-hand image leaves the viewer to fill in the blanks. However, Loli admits that while most of the time she tries to ‘say’ something with her art, some images are just doodles in which she has played with various cut-out pictures and combined them on a base image. A dedicated doodler, Cheeming Boey (known more often as just Boey) produces some breath-taking designs using only a Sharpie pen. 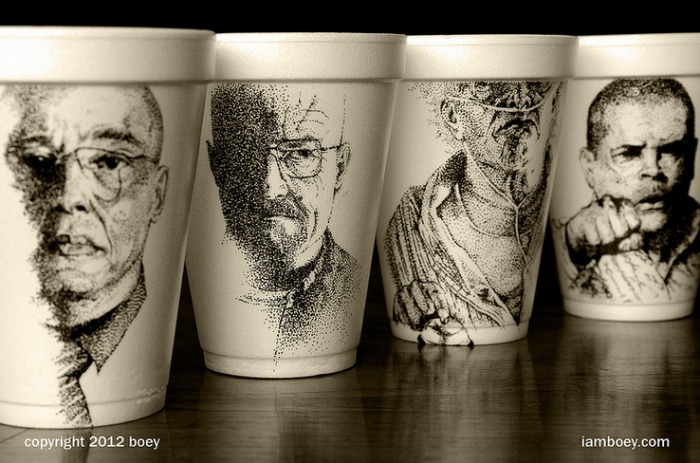 As well as his Cup Art pictured above, the Malaysian artist also produces a daily web comic and sells clothing adorned with his simplistic designs. Lauri Faggioni met the perfect champion for her quirky creations in French film maker Michel Gondry. Having met the director in a New York antiques shop which stocked her fibre art, she has worked as a prop maker on a number of his films including The Science of Sleep and various music videos. Hopefully these examples of simple art have provided you with some inspiration to be creative yourself. Take Cintascotch’s advice and share your creations with Zippi.